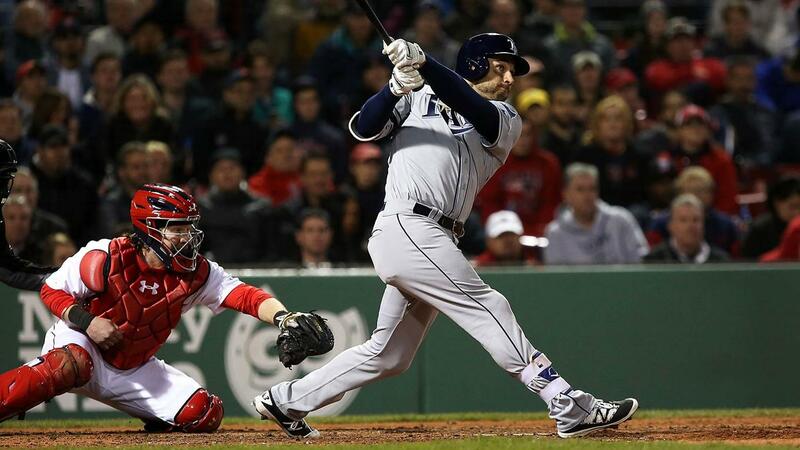 Kevin Kiermaier roped a homer deep into the right-field seats to open the top of the 10th and lead the Rays to a 3-0 victory over the Red Sox on Tuesday night at Fenway Park. It was Kiermaier's first homer of the season, and it came on a 2-2 curveball from Matt Barnes. The long ball was projected by Statcast™ to land 402 feet away from home plate, and then the Rays padded their lead on a two-run ground-rule double by Desmond Jennings that came after a two-out error by third baseman Travis Shaw. Lefty Drew Smyly was magnificent for the Rays, firing eight innings of one-hit ball. After a single by Jackie Bradley Jr. loaded the bases with nobody out in the third, Smyly retired 17 batters in a row before giving way to the bullpen in the ninth. "[Smyly] made it look pretty easy tonight, and I know it's not," Rays manager Kevin Cash said. "That lineup is very deep and has a bunch of solid hitters. So you can get tricked into thinking it looks easy, but we know it's not." Red Sox right-hander Joe Kelly was forced out of the game after recording just two outs in the first with a right shoulder impingement and will be placed on the 15-day disabled list. Despite the overpowering performance by Smyly, the Red Sox stayed in the game thanks to a stellar performance from the bullpen. Manager John Farrell deployed four relievers over 8 1/3 scoreless innings. "Outstanding," Farrell said. "They were efficient, they had good stuff and they threw a lot lot of strikes. All of them threw the ball exceptionally well." That stretch ended abruptly when Barnes came on to start the 10th against Kiermaier. It was the third loss in a row for the 6-7 Red Sox. The Rays have the same record, but have won three in a row. Smyly dominates: The left-hander extended his scoreless streak against the Red Sox to 20 1/3 innings. Smyly threw 105 pitches, 71 of them for strikes, and he tied a career high with 11 strikeouts for the second consecutive start. Missed opportunity in third haunts Sox: It seemed all but certain the Red Sox would jump out first when they loaded the bases with nobody out in the third. Chris Young and Ryan Hanigan opened with walks, followed by Bradley's single to center. But Mookie Bettsfollowed with a crisp grounder to third, and Evan Longoria easily cut down the run at the plate. Dustin Pedroia hit into a 6-4-3 double play, and the Rays were out of the jam. Kiermaier jump-starts offense: The outfielder was sitting fastball in the 10th, but he reacted quickly enough on a curveball to break the scoreless tie. Hembree strong in return: After Kelly departed, reliever Heath Hembree was pressed into emergency duty on the same day he was recalled from Triple-A Pawtucket. The righty came through in a big way, firing 3 1/3 shutout innings while walking none and striking out four. When Red Sox lefty Robbie Ross Jr. fielded a Longoria grounder and threw to first in the top of the sixth, Hanley Ramirez was initially pulled off the bag. Farrell challenged the call, and it was overturned after a review of one minute and 13 seconds. Though Ramirez did come off the bag, he got his foot back on an instant before Longoria arrived. In the top of the ninth, Farrell again tried his luck on a challenge play. Brad Miller hit a grounder to second and the Red Sox tried to turn a 4-6-3 double play. The throw by Xander Bogaerts pulled Ramirez off the bag at first, but Farrell challenged that the takeout slide by Jennings was illegal. However, the call stood. This was just the second time in the past 100 years the Red Sox were held to one hit or fewer in an extra-inning game. The last time was Sept. 18, 1934, in a 2-1 win against the St. Louis Browns. The last MLB team to be held to one hit or fewer in an extra-inning contest was the White Sox in a game against the Mets on May 7, 2013. Smyly has a 0.00 ERA in the first innings of his last 11 starts. Rays: Chris Archer (0-3, 5.87 ERA) is looking to find the magic in his fourth start of the season on Wednesday against the Red Sox at 7:10 p.m. ET after a disappointing beginning to 2016. The Rays' ace has not won since Aug. 31. The deepest he has pitched in a game this season was 5 1/3 innings in his last start on Thursday against the Indians. Red Sox: Righty Rick Porcello (2-0, 5.11 ERA) will face someone besides the Blue Jays for the first time this season. Porcello's only problem so far has been the long ball. He gave up two homers to Jose Bautista in his first start and two more to Edwin Encarnacion last time out.